On Saturday, October 27, from 10 a.m. to 12:30 p.m., the STL PROUD Coalition will give the public an opportunity to prevent pill abuse and theft by ridding their homes of potentially dangerous expired, unused, and unwanted prescription drugs. Bring your pills for disposal to the Opelousas Police Department Parking Lot at 318 N. Court Street in Opelousas. (STL PROUD cannot accept liquids or needles or sharps, only pills or patches.) The service is free and anonymous, no questions asked. STL PROUD Coalition (ST. Landry Preventing Rx drugs & Underage Drinking) is made up of members of the St. Landry Parish Children & Youth Services Planning Board. The coalition includes approximately 20 non-profit organizations, state agencies, local municipal governments, and businesses which service the needs of children and youth in St. Landry Parish. 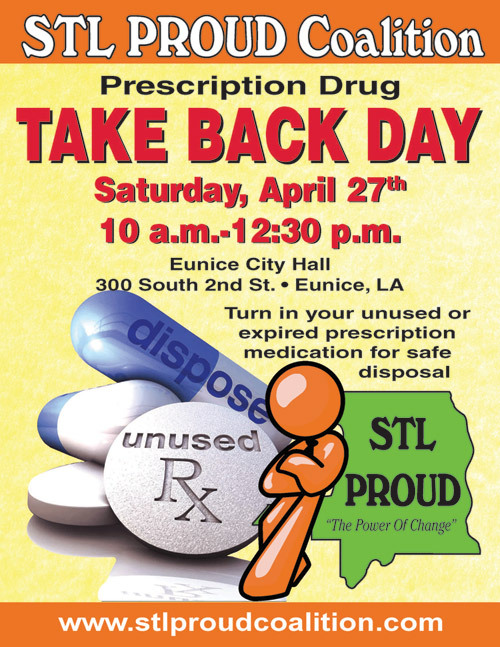 For more information about the disposal of prescription drugs or about the October 27th TAKE BACK DAY event, go STL PROUD Coalition website: www.stlproudcoalition.com or call 337-308-0234.